Welcome to the Super Aleste thread. It's a peaceful, prosperous thread. BS Super Aleste appears to be a revised version, so it'll be split; just ask for the board. DETAILS is for which console or emulator, which region release, etc. Warn somebody when you go and play that Europe version! 4. richter3456 - 9,105,990 - ALL - US cart+Real SNES? Last edited by Despatche on Fri Apr 05, 2019 12:40 pm, edited 34 times in total. Um, for my scores, you may want to add that I am using Snes9x. Those scores were from months ago when I last recorded them. The Tricky and Wild modes are really insane though, so I only did one for Short Game. Oh, you may have realized that I am playing Short Game on Tricky, so move that score from Wild to Tricky. I get the feeling it's a very easy game on Normal mode, because not only was that my first try, I got well into Area 8 without losing any lives. I also never ran out of special lives, but that's probably nothing special considering how many cycling power-ups there are for you to zap into Enemy Erasers. It definitely makes me eager to try Hard, though. I'm back on this game again, decided to give this a shot. You can actually make checkpoint milking out of this one, so are extensive ones on smaller enemies. Finally managed a target of 8mil in the game. 8.5mil should be my maximum. Accidentally lost it at stage 10, but managed to gain the upper hand at the last few stages. On stage 12, you can dies as many times as you want for some checkpoint milking, just as soon as you keep your last life. I am now preparing my snes9x replay file. Once it's uploaded, I'll put it here and put this on youtube. EDIT: replay file in now shown below the twitpic. Snes9x is required to see the movie. For more info, pls. see the readme shown along the zip file. YT vid still to be uploaded. the thing is that this game is infinitely farmable. Never Give Up, Never Continue! Indeed, because you can easily milk more on stage 12 than all the other stages but most importantly, you have to save a single life left against the boss. Oh, and according to the English Amiga Board Multi-Platform League, the top score is 8,965,160. Around 9mil is possible to obtain for most players, but it's too impossible for me now. If checkpoint milking is the name of the game... take this! Well I just got my copy of Space Megaforce and... tried to get a fairly high score but failed. I just had way too many of those golden ships. So whenever I died, I kept re-spawning in the same area. That way, I was not able to take advantage of the Stage 12 and rack up points. Played this on my SNES as you can tell. Stage 5 and 9 boss re-appear in this stage. So notably, you may want to kill these bosses first before sacrificing all your red ships (commit suicide before the final boss, or you'll lose your chance to rack up points!) You can get over 300k for each checkpoint to the start. Try to watch my youtube replay here. Thanks for the tip tinotorm, and the youtube video helped a lot. Well, taking that all into consideration I was able to rack up a lot more points then before and this time I think I really hit the mark. Took me a good two hours but it was worth it. I could have probably topped the high score, but that would have taken a additional couple hours and a sore thumb. Congratulations to ED-057, on getting 13 MIL. That's really something. I kow your's reaction : this guy post only one message and do an incrédible score!!! FAKE ! If you don't trust me it's not very important I just hope player read this and say : woooooooo I'd have done the same ! ^ 93 MIL!? You serious? Those are some huge numbers. Nevertheless, good job on getting that. But playing for 10-15 hours... wow. I suggest you use SNES9X, and record a movie of it on your next run. Include a screenshot as well. It's not very difficult to do this score but it's very long. HOLY $#!T ! YOU'RE INSANE! KEEP 'EM COMIN'! Last edited by tinotormed on Wed Jul 20, 2011 12:55 am, edited 1 time in total. You can JUST record the last hour of your gameplay if you're nearly there! Just record the stages except for 12 where you just record you current checkpoint, like I did. Do you want a normal run ( just 1CC) or a couterstop ?
! Just record the stages except for 12 where you just record you current checkpoint, like I did. - When you approach stage 12, stop recording to prevent accumulation of huge amounts of time. Begin recording again when you are down to the score you are after. That way, viewers or superplay watchers will not be like "Damn, I'm outta here!" or "I turn this off" or something. Or better yet, just record your counterstop clip on your next run. but I don't farm stage 12. Really, and why did you have a higher score there? 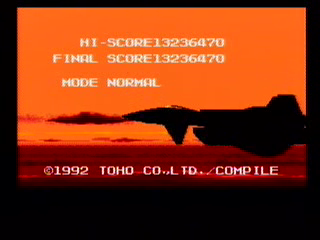 Well, it is STILL farming, as you took many hours to amass bigger points (a la R-Type except with excessive 1ups.) Maybe after STGT, I am coming back to this one, but no record this time, except for the last part. Oh, and for this farming thing, it happened the same on Gunnac (stage 3 boss(take out arms, use weapon 4 to grab points off destroyable fireballs)) and Gunhed (stage 4 mid-boss (destroy the eyes with weapon 4 but not the turrets on where it came from)). Anyways, good luck on that c-stop goal though. Do you want a normal run ( just 1CC) or a couterstop? Both. If you go for the counterstop, please finish the game. I had a score once before, when circuitface was the maintainer. I didn't transcribe the score to paper or take a screenshot, I just messaged him the score and that was it. He wasn't able to update during that time so the score was lost. Decided to make another attempt and it was probably close to the same as before. 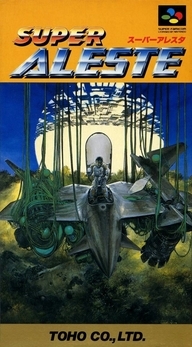 I think that in this game, restarting at a checkpoint is very much akin to using continues in any other typical console shmup. Therefore, I suggest taking some kind of action to separate scores that were achieved with checkpoint-restarts from those that weren't. This would solve the milking problem and give everyone a more interesting challenge. Of course, I bring this up because my score here comes from a straight run with no restarts. On the other hand, do the bosses time out, or are they infinitely milkable as well? I'm very sorry, but I just can't do this. Once you need to put in a limitation like that, the entire point of that limitation suddenly disappears. It sounds far too much like something Twin Galaxies would do, which I am not for very good reason. I knew the 99,999,999s were coming, I knew it would be pointless to try and stop them. For the record, I don't think these were good ideas either. Thus, I do think that taking these sorts of challenges to a brand new thread is best. I also think comparing checkpoints to continues (and implying there's a difference between continues on console and continues in the arcade) is completely ridiculous, but whatever. Actually, I think that that's pretty reasonable given this thread's circumstances. Maybe I will start a new thread, then. For this particular game, I really do think that the checkpoint system is at least very similar to using continues. This is mostly because in addition to taking weapon downgrades, you can die multiple normal deaths before actually having to restart. The only thing that's missing is a "Continue? Yes/No" screen at that point. Between that and the infinite checkpoint milking, I think imposing a limitation like what I mentioned could be engaging, and in a very straightforward way. ...unless you can milk the bosses infinitely. I guess I'll check on that. EDIT: It appears that they time out, and give no bonus upon doing so. Interesting!